COMET is a member of CURES - Civics United for Railroad Environmental Solutions. The goal of this new group is to pressure elected officials for changes with respect to railroad pollution, emissions and practices. As mentioned in the Times Ledger, "The group wants both the MTA and the state Department of Transportation to allocate more funds for inspections of trains, redirecting garbage containers to barge transfer stations and for retrofits to the New York & Atlantic Railway’s aging fleet of locomotives." Federal stimulus money has been allocated for similar purposes in other districts. We want some of it to come to western Queens to upgrade the LIRR's locomotives to make them cleaner and quieter and purchase new garbage containers that seal in odors adequately. We also are pushing for more frequent cleanups along the tracks to discourage dumping. 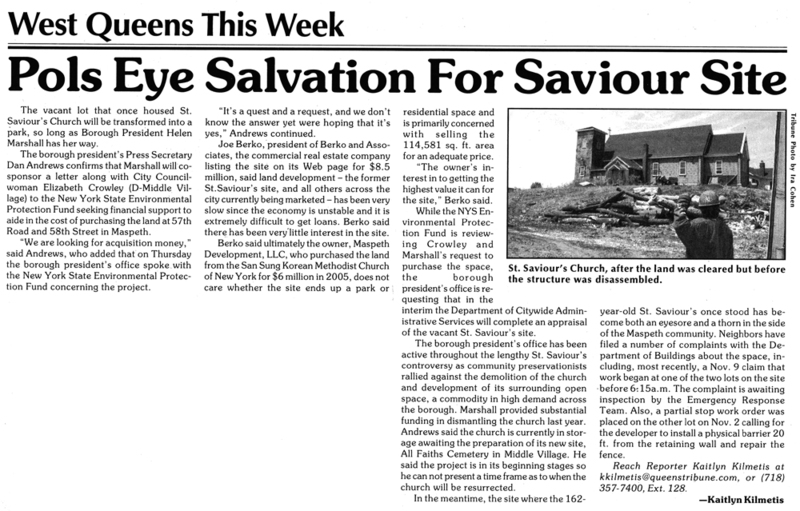 This past week, the Daily News and Times Ledger published stories that mentioned that Council Member Elizabeth Crowley and Borough President Helen Marshall have applied for funding from the state to purchase the St. Saviour's site. Parks Commissioner Adrian Benepe has stated that the city would be interested in acquiring the property so long as the elected officials can raise the money to pay for it.